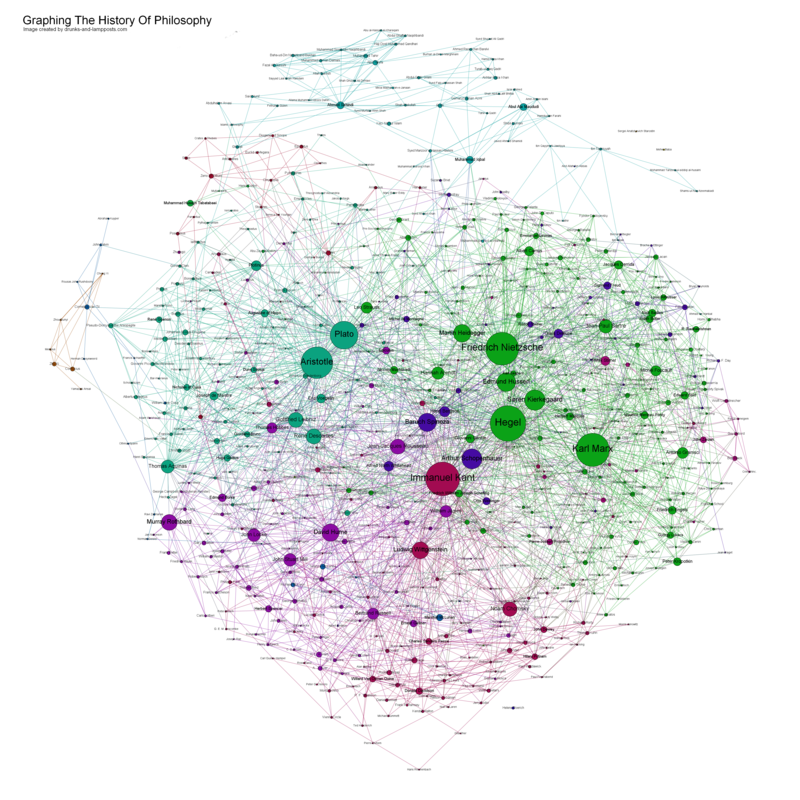 Continuing on my recent project of making interactive network graphs (on projects where other brilliant people have already done the difficult querying), here's a visualization of the CRAN package dependencies. Sure, the philosophers graph is maybe more interesting, but this is a very real map of people power, too---and maybe as influential in these statistical times. The absolutely artful data munging here comes from librestats. Check out his post! Resuming from last time, I've made some updates to the philosophers' social network including publishing two interactive maps. Quick introduction: you know that sidebar on wikipedia where it tells you someone was influenced by someone else, linking to them? These graphs are generated from asking wikipedia for a comprehensive list of every philosopher's influence on every other. There are some sample-bias issues and data problems I went over in the first part of the series, but overall it's both beautiful and interesting. The first lets you zoom dynamically and makes it easier to see local networks. When you hover over individual philosophers, those who are not linked to them or from them disappear. This uses a tool called sigma.js. Using a scrape of the data behind wikipedia's sidebar for philosophers, Simon Rapier put together a fantastic visualization of the schools and interconnections among philosophers. Griffsgraphs followed up by expanding the scrape to the entire network of influencers and influenced on wikipedia. Both of these are insightful humanities studies in graphs and visualization---even though the algorithm wasn't told which common ideas link Hegel and Marx, it saw that they were similar enough to be grouped together (shown by making them the same color), and that the way Hegel influenced, say, Husserl, was different enough to warrant another school, simply by observing a different group of people followed them. That's a solid aggregation of a lot of humanities information. Who knew Skynet's tweed jacket had patches on the elbows? I really liked this story on the 37signals blog yesterday where Jason Fried explained the process of seemingly serendipitous events that led to his being asked to write an opinion piece in the New York Times. I've been working with network visualization lately and turned his story into the graphic below, which they've kindly posted back to the 37 signals blog.